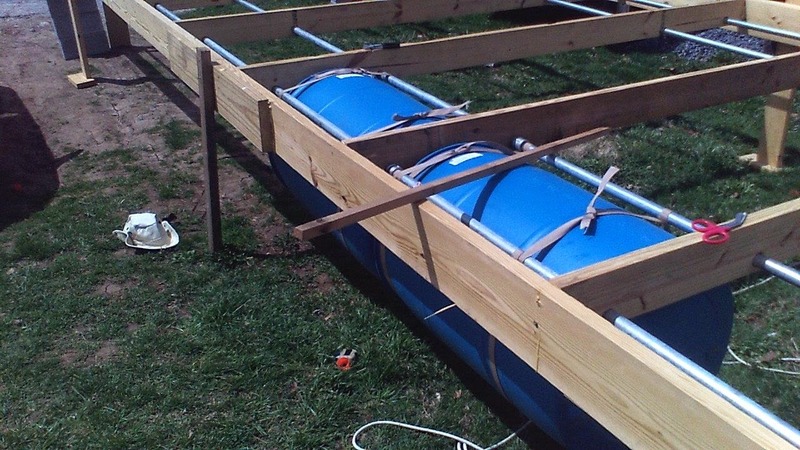 The blog of the design, construction, and launching of the vessels "The Floating Empire" and "Tesla's Revenge", both floating tinyhomes made from recycled or repurposed materials. 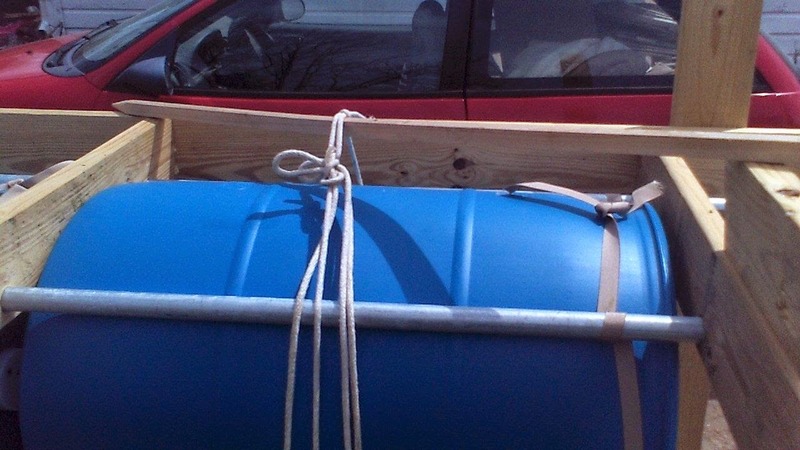 On a cloudy and blustery day we ventured to our local Lowes, got the remaining pipe....that I forgot....and the plywood for the deck, and tied into building same. Since so much of this construction is experimental, we're constantly rethinking things. I'd intended to use this really very clever scheme using stainless steel rings and 600 lb test nylon webbing to hold the barrels in place. ....didn't work. We wound up tying them, which will be inelegant, but fine. First, you start with your pet barrel. 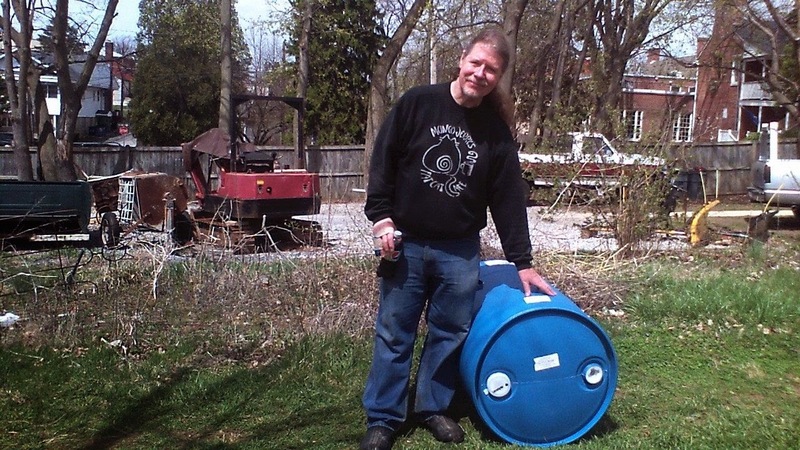 It's my pet barrel because it followed me down to the worksite....and very nearly into the alley, across a parking lot and into the side of a lurking Police car, but I digress. 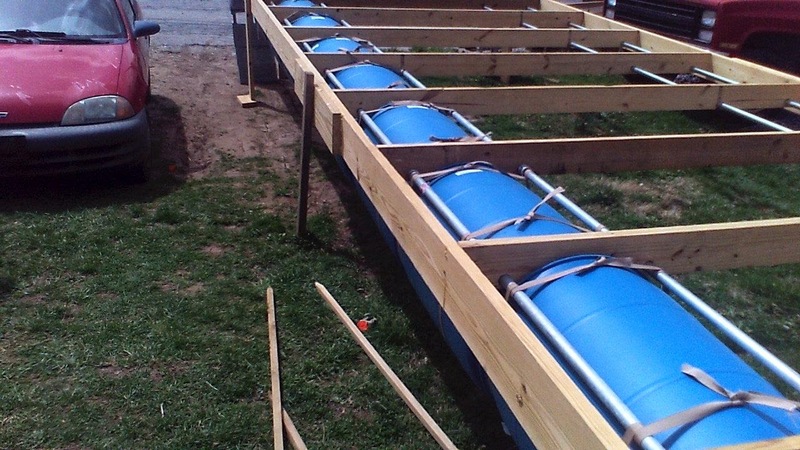 We basically used a twisted rope--a "Spanish windlass"--to pull the barrels up into place. 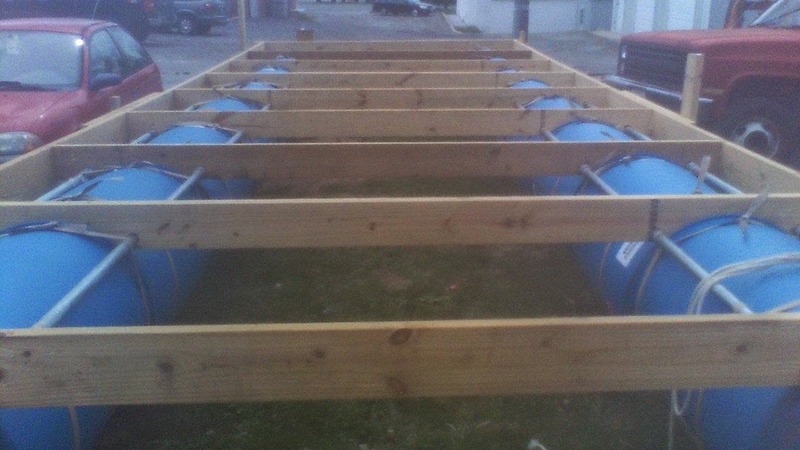 Since our frame is elevated and upright, we can't just tie them on as you could if building inverted or on the ground. It took us a bit to hit on what method we were using to jack up and attach these. We finally wound up levering them into place from below with a couple of sticks, cinching them off with sash cord, and then tying them in two places with the webbing. Here's the first row finished. Please note, you are NOT going to get these snugged tight. They'll hang moderately close to the pipes with a bit of slack between. That's okay. Water pressure will snug them up into their places once you get them wet. The challenge is getting them to the water in place. Here's both ranks in place. This was FAR more strenuous and time consuming than we'd anticipated. BUT it's done! The two front floats will have to wait until I can move the support piers....they're in the way...but we'll get the stuff for the new supports tomorrow and put them in Wednesday. Tomorrow, they're predicting another full day of rain, and it'll be interesting to see how much stretching or contraction the straps go through. Regardless, this was one more huge hurdle we had to get past. 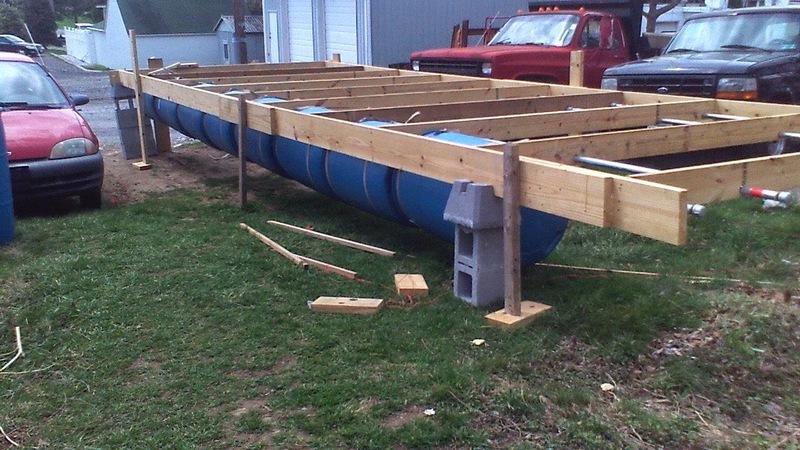 Wednesday, we'll paint and deck the hull (more on that later) and begin erecting the walls. I'm pleased, I'm sore. stay tuned. We'd love to get your comments (though you will have to have a wordpress or gmail account to sign in). Please let us know what you think. This is fascinating. I take it this is your way of escaping the grind? It is indeed, Dominic, and a way of spending our lives doing art full time for a change. THE DECK IS IN PLACE!! How is it that I'm still moving.....?